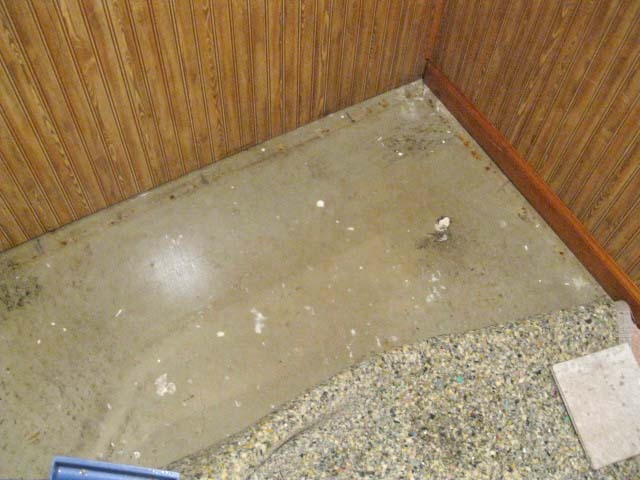 Our basement flooded in June 2011 and because we thought the damage was from flooding, we did not file an insurance claim. When the basement flooded again in July 2012 we found out that the water had been coming from our AC/furnace unit. Oh well! We finally “finished” remodeling (except for the stairs) in November 2012, only to have our hot water heater die and flood our basement 2 days before Christmas! We just couldn’t catch a break! Except that the extra steps we had taken to prevent future water damage really paid off. 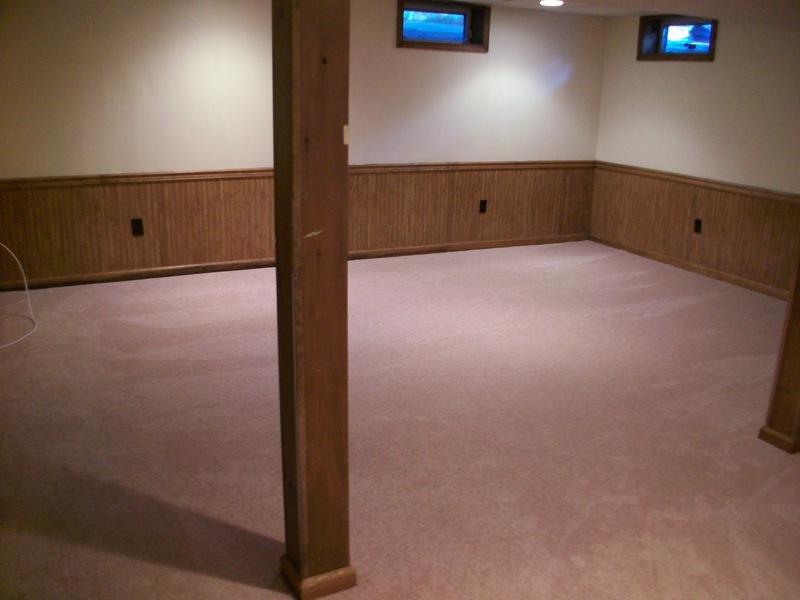 This is the basement the day we moved in, July 2009. That is faux wood paneling. I had never seen anything so ridiculous before. I never liked any of the dark wood, metal outlet covers, dingy windows with OLD glass louvers that didn’t shut all the way. But I had bigger fish to fry and decided to leave the basement alone. 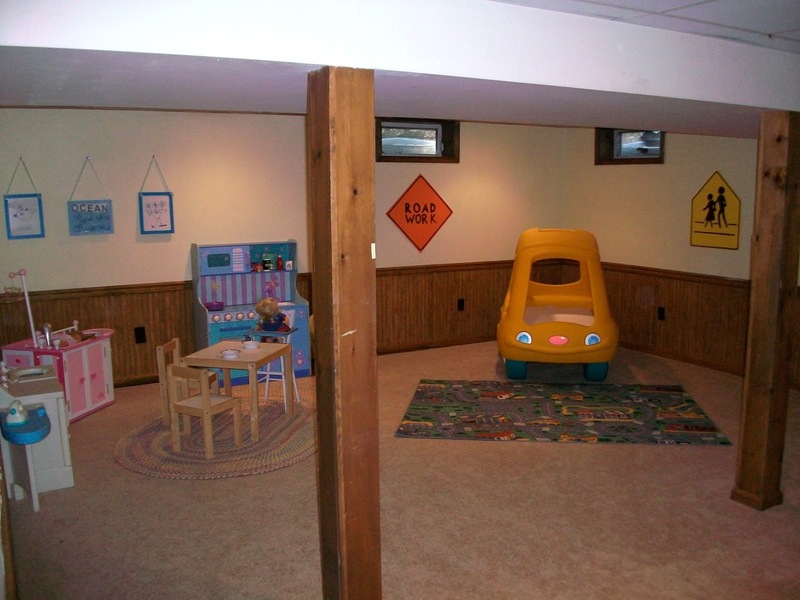 I was just happy that it was already finished because we didn’t have a finished basement at our last house. This was the basement when I first set it up. It was a big hit with the kids from our playgroup. It evolved and improved over the next two years, but I can’t find any more pictures. And then the flooding began 🙁 We took the carpet and baseboard out immediately. Well, as soon as I could convince my hubby that we actually had water in the basement, then we started taking stuff out. We were convinced the water was coming from outside. So we replaced all three window wells (read about that project here). There was A LOT of water, so we ended up taking out the paneling, the bottom of the drywall, some insulation… blah, blah, blah, in the end we took out EVERYTHING. All the drywall, all the insulation, the windows, even the freaking studs. I was sad. Very SAD! It wasn’t so bad in the summer, but the winter with a 2, 4, and 9 year old and no place to run around was tough. The worst part was that all that crap that was down there, was now scattered all over my house, in the bedrooms, family room, living room, EVERYWHERE. I used it as an excuse to not do any home improvements for a year. Well, it kept me from not doing as many as I would have liked.